Yes, I am attending AX on Saturday. Currently my schedule is to catch up with some old friends and then head to the DC LA Meetup. Super Exciting! The idea sounded *heelareeous* at first. I would pass out envelopes with little heart stickers and get a few laughs here and there. And then I got a little bored with the idea. But by then, I had 50 heart stickers. : / Whoops! Gotta see this through to the end now. Bah. 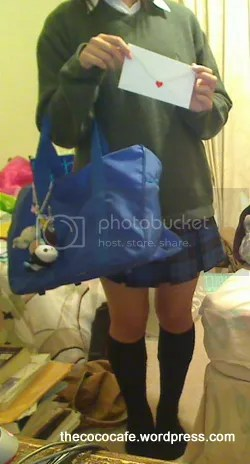 At least the my “schoolbag” is cute with all those character mascots. Oh yeah, and that little thing before the jump is to the tune from this old cartoon. 😛 Anyone else remember it from thier childhood days? Be waiting on cosplay photos from Anime Expo!!! 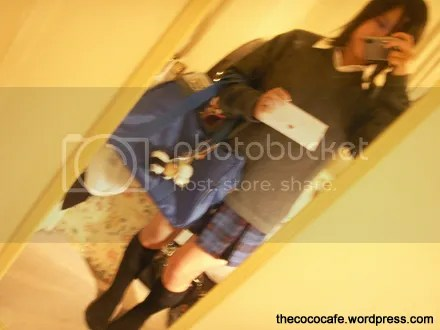 Have fun dressing up as a love letter school girl!!! Would like to hear the reaction one gets from your cosplay!!! I’d like to see your FanExpo cosplay too! I’ll save one for you then. 😛 See you there as well! I came late and couldn’t find you >_< Sorry Coco T-T Maybe I'll come again next year. Hey there, it great to know you. I’m happy I make new comrade today. How your meeting with Danny Choo? Well I actually think that your Idea is actually pretty,pretty awesome and that Viral Marketing experts would be proud of you. Its definately unique and will keep you in peoples minds. I think that’s adorable! Did you hand them all out?